This post is from Anna at My Life and Kids. 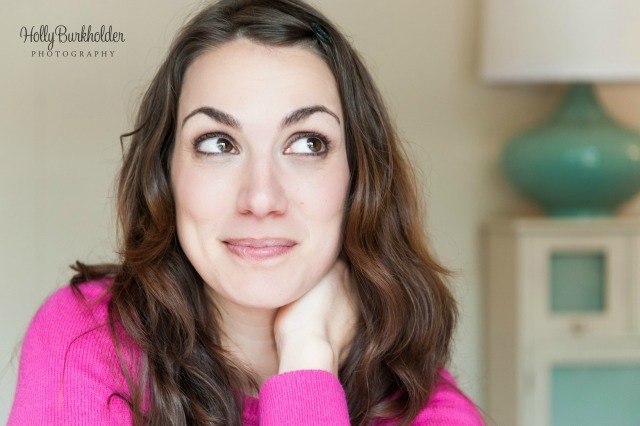 I met Anna at Bloggy Boot Camp Chicago last year when we sat next to each other. I really value Anna’s sense of humor and way of looking at motherhood. Hi, my name is Anna Luther, and I had three kids in three years. Then I quit my job, bought a minivan and started wearing mom jeans. I blog about it all at My Life and Kids. I had the pleasure of meeting Sarah at a blog conference last November, and I’m thrilled that she invited me to guest post today. With three little kids at home, I am constantly searching for fun games and activities that will keep them entertained – and help us all avoid meltdowns (yes, myself included). I compiled 75 of my favorite activities into an eBook called 75 Ways to Have More Fun at Home! From sensory trays to how to make the most realistic fake casts (Dr. Mom, anyone? ), this book might be just what you need to get you through the rest of the summer. And – it’s only $0.99 right now! You can click here to download it as a PDF document. Or you can click here to purchase it on Amazon (and read through some of the 19 5-star reviews). I’ll be the first to admit that we don’t do all of these activities every day – or even every week. But when I do just one of these things – it’s usually guaranteed to be a great day. 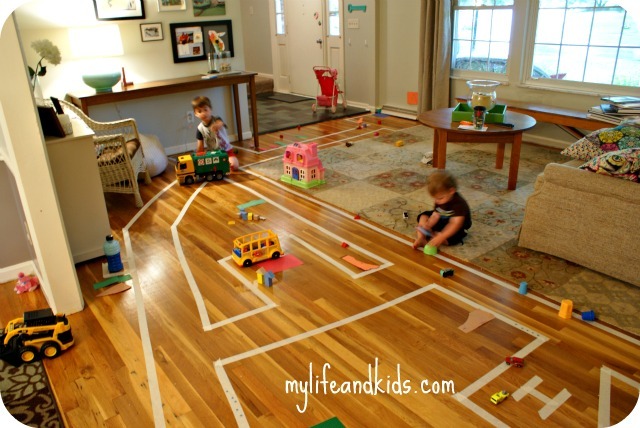 Here are three of my favorites: Masking Tape Village Masking tape (or painter’s tape) makes great roads on hardwood floors – and even on carpet. And it’s a great activity to get the whole family involved. My oldest planned out the city, letting me know where the grocery store, school and bakery should go. My middle child decorated the roads with stickers. And the baby tore down buildings. It was a full morning of fun to build the village, and weeks of fun for my son to play with the village after it was finished. And the tape came up very easily when we were ready to tear it down. Host a Surprise Party! With little kids, it doesn’t take much to have a party. Some streamers, a few signs, and some type of special treat, and you have a celebration. Bonus if you have candles. It’s not your birthday? It’s not anyone’s birthday? Yes it is. It’s dolly’s birthday. Or the dog’s birthday. Or stuffed McBear’s birthday. Last month, it was our minivan’s birthday. You don’t need a good reason to celebrate – you just need to celebrate. And nothing gets my kids more excited than assembling all of their “stuffed” guests, helping me decorate, surprising the birthday “thing”, blowing out candles and singing Happy Birthday. Every now and then we wrap up a present of some sort. On days when I’m really not feeling festive, I tell them it’s my birthday. I always get into the celebrating mood when we’re singing to ME and giving ME presents. Make Farting Noises So apparently, in addition to being a mom, I’m also a 12-year-old boy that can’t stop giggling when I hear a fart sound. Seriously – it gets me every time. So I went ahead and compiled a list of how to make the very best fart sounds ever – complete with photo and video tutorials. Having a rough morning? Let some fart sounds rip and see if that doesn’t change things around. Your kids are whining because they don’t want to do their chores? Chase them around the house while making fart sounds – that should do the trick. Your husband is being ridiculous? A juicy fart sound might be exactly what you need. You can read the full tutorial right here. You’re welcome. If you’d like to win a free copy of 75 Ways to Have More Fun at Home, leave a comment on this post. Three people will win a free copy. And everyone else can click right here to purchase your own – for just $0.99! Love these ideas. The fart noises crack me up! Hilarious, as usual. Painter’s tape is a great idea! Will definitely use that one. And fart noises (and jokes)…I’ll never grow out of it either. I love the village idea! A great activity for a rainy or a too hot day. I always enjoy Anna’s blog! Can’t wait to try the masking tape idea! Would love a copy of the book!!! I’m so relieved that I’m not the only one out there who can’t contain the giggles, despite how immature it may seem . The worst is when it happens at an awful time, and you really shouldn’t laugh, but then someone else (usually a child) laughs, and there is absolutely NO WAY to hold in the giggles once that happens. I just wanted to leave a comment and say that I bought Anna’s eBook at the beginning of the summer and it has been SO handy for helping me deal with all of the rain we’ve been having. As soon as we start entering meltdown mode, I grab the copy I have printed out in my kitchen, and I find something fun to do. Works every time. Thanks so much for putting this together, Anna! I would love some new ideas! I just had my 4th baby and am so tired…. It would be great to do sme new things with them! !